Pure Via Sweet Life Twitter Challenge! Who doesn’t love a taste of sweetness? Whether it’s a kind gesture from a stranger, a loving message from a friend, or a delicious treat. While I love a kind gesture, I happen to love a tasty treat. To celebrate the sweet things in life, Pure Via™ Stevia is hosting a Twitter Challenge encouraging Canadians to make every day sweeter! So, make sure you are following @PureViaSweet on Twitter because starting February 10th until February 26th, they will be tweeting out “Daily Sweet” questions and weekly “Sweet Challenges” all themed to make your life sweeter! The first daily tweet from each participant will count as an entry into grand prize draw of a $1,000 Visa gift card and fabulous Pure Via product. The grand prize winner will be announced on February 26th. Additonally, throughout the challenge, you will have the chance to win awesome prizes, including Pure Via products, Visa gift cards and a special Valentine’s Day gift set! I, for one, love a challenge like this! Twitter is great for many things but, it will be refreshing and a whole lot sweeter with the Pure Via Sweet Life Twitter Challenge. Will you join me in spreading the sweetness and love for the next two weeks? First and foremost, follow @PureViaSweet on Twitter! Use the #PVSweet in ALL of your tweets to @PureViaSweet. I am and I am excited to share a little love and sweetness for the next two weeks and hey, there’s super sweet prices involved too. After all, there’s so much in life that should be celebrated and better yet, shared. Will you be following along and joining me in this SWEET challenge? I love stevia! I use it every day. It's so much healthier! Me too Ellen, I love it. I'm not in Canada but it might be fun to follow along and see the challenges. This would be a good option for me since we cut out sugar. The challenge sounds fun! I am a big fan of stevia, and I love that it is becoming easy to find in products like this. Anything that makes it easier to be healthy works for me! Same here, without having to give up the sweetness we crave. I really like Stevia! It is a great alternative to sugar and unhealthy sweeteners. What a great twitter challenge. Me too! And double yes to that. Great prizes and spreading the sweetness too! That sounds like a really fun twitter challenge. I'm going to have to join in! Sounds like a neat challenge. I might join in on the fun :-)! It runs for two weeks, so I think you have a good chance! 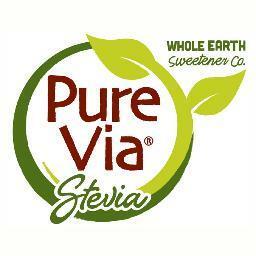 I've used Pure Via stevia and like the brand. I won't use aspartame or sucrulose or saccharine. I only use stevia or local, raw honey to sweeten. I am with you. 🙂 Great for baking too. My life could definitely be sweeter! Sounds like a fun opportunity. Following on Twitter! Prizes, sweetness and fun. 🙂 Can\’t go wrong. I use this in my coffee all the time and it's great! I prefer it over sugar now!!! Sounds like a fun twitter event! Going to check it out and learn more about the product. I have never tried Pure Via before, does it leave an after taste like so many sweeteners on the market do? My recent post DIY Foam Hand Soap For Only Pennies! I do not think Stevia leaves a bad aftertaste. I use it everyday. Compared to artificial sweeteners that do. Awesome! Good luck on winning! I just clipped a coupon for Pure Via last weekend! I’m going to give it a try the next time I bake something! Contest on Twitter are so much fun! I use a lot of Truvia. Keeping my fingers crossed for a big win! TONS of FUN. Easy to enter too. Make sure you look out for Pure Via, that\’s the brand! i haven't tried stevia yet. i need to. i 'll try to pop in at the party! For sure, it is going on for two weeks so you have plenty of time to share and enter. I have never tired this sweetener before, does it have an after taste? I do not think it does. I like the flavor compared to sweetener. I use this in my coffee everyday!! Love the flavor of it. this looks fun doesn't it? I love Stevia, using it has helped me lose a lot of weight. And I love the theme of their Twitter party. Who doesn't want a sweet life? So true and congrats on the weight loss. I haven't tried this brand but I do hear good things about Stevia. Great Twitter party prizes! It is actually an event for two weeks. 🙂 But, yes Stevia is awesome. My name is Jen and I'm a sugar-aholic! I have tried many artificial sweeteners and never have found one that I like as much as good old sugar. I was actually surprised to try Steevia because it was very very close! What a fun challenge! Tweet to win contests are always fun! I didn't know about this sweeps yet, so thanks for sharing. Heading over to Twitter to watch for questions! I will definitely be following along and taking the challenge! I love pure via!! I have replaced sugar with it in most of my baking and it works great.